But don’t get over anxious, you should not be stomping around on squishy soil. Snow melt and early spring rains can saturate your soil, which is absolutely perfect for your plants. But even just walking on the lawn will compact the soil, and walking through garden beds can damage plant roots. Wait for the soil to warm and dry out before you get started. Pick up fallen branches. You can save them for kindling, chip them up for the compost or save them to use for plant supports. Prune damaged or broken limbs and branches. Most shrubs and trees can be pruned now too. Be careful of spring flowering shrubs! You will be pruning off the flower buds, so wait until flowering is finished for those. Rake leaves out of bushes, corners, and anywhere else they have accumulated and add them to your compost pile. Remove dead annuals from garden beds and containers and start a new compost pile. Empty containers into your compost pile, clean, and refill with fresh potting soil. Remove any coverings and windscreens from evergreens - ONLY the evergreens, not roses or perennials yet. Any perennials or perennial grasses that were not cut back in the fall can be cut back to about 6 inches now, but do not remove winter mulch yet. Be careful not to cut new green growth on early starters. If any plants have heaved out of the ground, press them gently back into the ground. Tamp them down thoroughly, but gently. Pound fertilizer stakes into the ground for the evergreens, trees and bushes while the ground is still soft. Once the soil is dry, warming up, and the very first signs of growth start to appear you can start the next group of chores. One of the first signs that the frost has gone out of the soil is the greening of your grass, usually not until April in northern regions. Rake the lawn to remove snow mold, fluff matted grass, remove thatch and dead grass and stimulate growth. Prep damaged lawn areas for seeding. Pull perennial weeds while the ground is soft so you get the root out well. Remove all mulch and debris from planting beds and gardens. 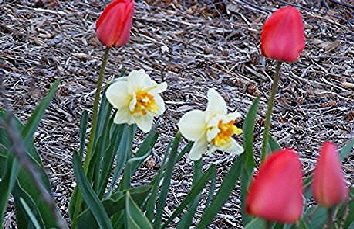 Apply a 10-10-10 fertilizer to garden beds planted with spring flowering bulbs. Refresh trellises and fences with a coat of paint before everything starts growing. Once the danger of hard frost has passed (light frost should not be a problem for hardy perennials or roses) remove all winter mulches and plant coverings. Cut back perennials if you don’t do that in fall and prune roses. Prune deciduous shrubs and woody perennials at the first sign of growth (you should see buds beginning to open) if you have not gotten to it yet. Top dress perennial beds with compost and work lightly into the soil where you are able, or apply a balanced granular fertilizer. Divide overcrowded perennials as soon as they emerge from the soil. Hopefully you added plenty of organic material to your vegetable beds or new garden beds last fall. Till that matter in thoroughly now. If you didn’t amend the soil last fall, till in composted manure now. Aerate planted beds where you can without disturbing plant roots by pushing a garden fork into the soil and give it a good wiggle. Where that is not possible use a hand cultivator to loosen the top soil. This will help the soil and your plant roots to take up water and nutrients. Apply a pre-emergent crabgrass control to the lawn when the soil temperature reaches 50 degrees (when the forsythia blooms or when you see your first dandelion bloom). Freshen summer mulch in perennial gardens and shrub borders. Looks like you are all ready to plant now! Get to the garden stores to browse for new ideas! Cool season vegetables can be planted before your final frost date, as well as frost tolerant annuals such as geraniums and petunias. You can also plant hardy perennials early as well as shrubs, trees and evergreens. More tender annuals that you plant in containers can be easily moved into the garage is frost threatens. Enjoy your gardens and the joy of spring sunshine!